When my children were born, I often put them to sleep in the bassinet that came with their stroller. It was small and cozy and I was able to keep it near me during the night. I did not like putting my newborns into a standard crib because they are so tiny. 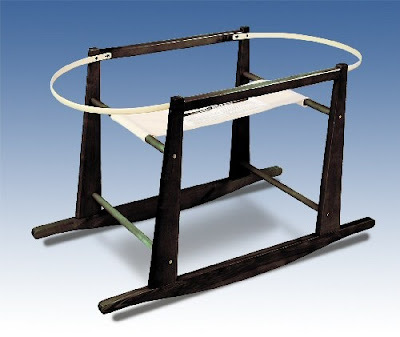 I used to put the bassinet on the floor until I discovered the Rocking Moses Basket Stand by Jolly Jumper. It is made to fit a moses basket, however many people who purchase it do use it for their stroller bassinets because it fits so perfectly. There are a few reasons I love it. One is that it rocks, which is great for those nights when the baby refuses to go back to sleep and the only way that will happen is with tight swaddling and a rocking motion. Another reason I love it is because it keeps the baby off the floor and brings them up higher and closer to me. The bassinet was easier for me to access when it was higher and I also had this fear that in my sleep deprived stupor, I would trip over the bassinet if it was on the floor. I also love the look of the rocking stands which made me even happier. It comes in 2 styles (standard and deluxe) and 7 finishes so you can pick which one best matches your decor. It is also priced very reasonably at under $50 for the standard version.